My father was born in Aleppo*, Syria on December 21, 1946, the year that the French occupation of Syria ended. A son of a second generation of urbanized Sahani bedouins, he was the first of his siblings to be born in a hospital, and left Syria three years before the "Corrective Movement" (1971) was ushered in by Hafez al-Assad, a movement, installed by Bashar al Assad's father, that declared a state emergency still in effect today. This might seem like a simple or even a trite statement. Regardless, this sentiment most accurately captures my resilient ties to a region of the world you may have heard frequently mentioned these days: Syria. I wonder sometimes what you might think of this place and, moreover, what you might have thought of it before March 2011 -- when the media found violence to be its adequate synonym (on The Huffington Post Blog alone the second most used tag for Syria is: "syria violence"). You may know it for violence, destruction, rubble, heart-breaking coverage, car bombs, death tallies, perplexing headlines or complicated subplots. You might have heard it used in relation to Iran, Russia, Hezbollah and Israel. You may have heard of children and youth being systematically tortured to death, like 13 year-old Hamza al-Khatib, whose mutilated body (by the regime) was returned to his parents. You may have also heard the dumbfounding death toll of more than 40,000, one that rapidly escalates daily -- even in the midst of cease-fires. ‎Damascus measures time not by days and months and years, but by the Empires she has seen rise and prosper and crumble to ruin. She is a type of immortality... Damascus has seen all that has ever occurred on earth, and still she lives. She has looked on the dry bones of a thousand empires, and will see the tomb of a thousand more before she dies. Although another claims the name, old Damascus is by right, the Eternal City. These historical revelations represent just a sliver of stories I heard from my Syrian-born parents growing up in a Southern California suburb; stories that have collectively transformed my sense of self, narratives that have constructed the lens through which I see the world; and stories that have especially influenced the way I process the present conflict. And yes, some of my friends and family have died, been tortured, abducted, detained and displaced since March 2011 in this... this... this... what can we can we even call "this"? Many have fought over what to term it: "uprising," "revolution," "civil war," "proxy war," "Western intervention," "sectarian conflict," or even "massacre." But I tend to be preoccupied with the millions of humans beings and the millennia of history this land cradles rather than the geopolitics of its borders and the politicization of religious sects. Unlike many Syrian families residing in the U.S., we did not spend our summers in our ancestral homeland. My father, the Webster's dictionary definition of a workoholic, worked 364 days a year (only taking July 4th off, a testament to how patriotic my father can be). And when he left his hometown of Aleppo in 1968 to study engineering in the states, he never returned. My mother migrated to the states after marrying my father in France. Although she was born in Syria, ancestrally hailing from the port city of Latakia, she grew up for most of her life in Lebanon. Her family ultimately fled Lebanon in the '70s at the onset of the civil war. Although I did not travel back to Syria and Lebanon 'til I graduated from college, my five siblings and I grew up hearing my mother and father's childhood stories. When I finally traveled solo to Lebanon and Syria, weeks after graduating from UCLA, I started to create my own stories, as I returned over and over again almost every summer since. I wanted to share my stories with you, so that you might know a land and people beyond distorted filters of violence and destruction. 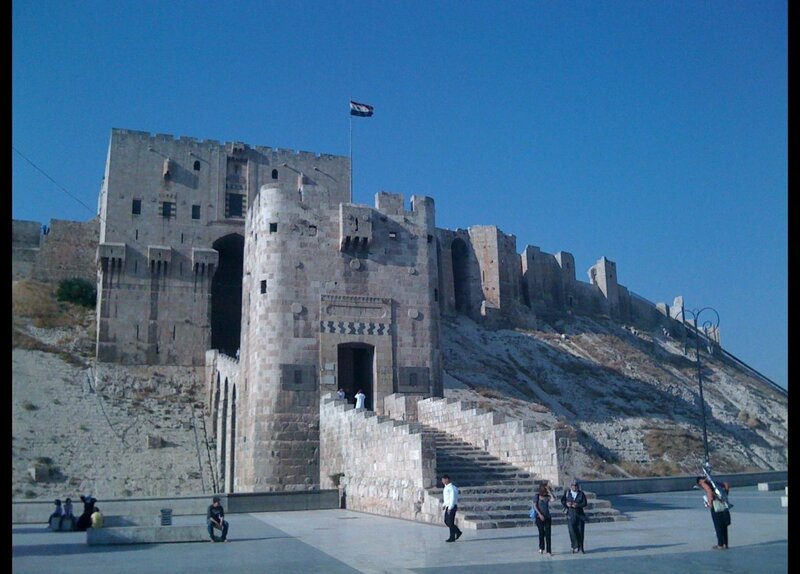 *In Arabic, the city is referred to as "Halab," meaning "milked" or "he milked." This is a reference to the story of Prophet Abraham sharing the milk of his goats with the impoverished Aleppines during a spot en route to Canaan -- and this I learned from Syrian Jews in Aromas of Aleppo: The Legendary Cuisine of Syrian Jews by Poopa Dweck. Aleppo: one of the oldest continuously inhabited cities in the world, home to my father's ancestry. The Citadel is known to date back to the 3rd millenium BCE. The nearby <a href="http://www.archaeology.org/0911/features/syria_aleppo_temple_storm_god_citadel.html" target="_hplink">Temple of Storm God Adda</a> is even older than Egypt's Giza pyramids .